An heroic Army dog has won the animal's equivalent of the Victoria Cross for disarming a gunman while on duty in the Balkans. 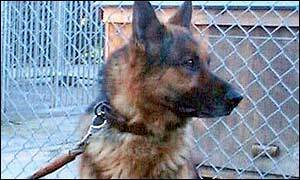 Sam, a German shepherd, is being posthumously awarded the Dickin Medal, after also holding back a baying mob, bent on attacking ethnic Serbs in Bosnia-Herzegovina. The dog performed the feats of bravery while on duty with handler Sergeant Iain Carnegie in Drvar with the Royal Army Veterinary Corps Dog Unit. Sam, who died of natural causes two years ago, is the first Army dog to win the medal since 1944. In 1998 Sam gave chase to a gunman who opened fire in the town which has been the scene of ethnic tensions. Sargeant Carnegie said in the medal citation: "After a chase Sam brought down the suspect and I disarmed him, retrieving a loaded pistol. "Sam performed brilliantly - just like a training exercise." Six days later a mob armed with crowbars, clubs and stones surrounded a group of about 50 Serbs, but Sam held them off until back-up arrived. "Sam displayed outstanding courage in the face of the rioters, never did he shy away. "I could never have attempted to carry out my duties without Sam," said Sergeant Carnegie, from Melton Mowbray, Leicestershire. "His true valour undoubtedly saved the lives of many servicemen and civilians." Sam retired two years ago at the age of 10, and died from natural causes soon afterwards. He becomes the 59th animal to be honoured since the award, which is decided on by the PDSA animal charity, was established in 1943. The Dickin Medal was introduced to honour animals which made an outstanding contribution in World War II. Sergeant Carnegie will collect the medal during a ceremony at the Royal Army Veterinary Corps headquarters in Surrey next month.